Good afternoon, and welcome to Fun Friday! Today’s post is short but sweet. 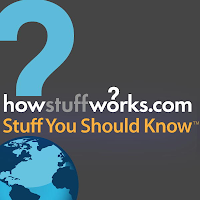 I want to recommend a podcast called “Stuff You Should Know.” It’s part of the site called “How Stuff Works,” which has a large selection of podcasts, programs, and other interesting information. Every few days “Stuff You Should Know” posts a new program about a different topic. You can follow them through iTunes (that’s what I do) or another podcast manager, their Facebook page, or you can also get the podcasts directly from the website. Some recent programs that I liked included one about tipping (definitely appropriate for people traveling to the US) and one about how dueling works. Check out the podcast and the site if you want listening and vocabulary practice.